Your water softener is an important part of your home’s plumbing system. It helps replace the minerals in water through the process of ion exchange. But water softeners don’t always work as planned. Knowing how to check if your water softener is working can help you maintain the quality of your home’s water supply while preventing unnecessary repairs down the line. Below are the signs of a malfunctioning water softener, along with some plumbing solutions to put in place to keep your family’s water safe. Hard water spots are one of the most common signs that a water softener isn’t working. These can appear on shower doors and faucets, and they result from the buildup of minerals in the water. In some cases, homeowners may find that their water feels harder. This generally occurs in homes that have used water softeners for a significant amount of time. When they stop working, your water may cause you to experience itching or dryness after taking a shower. Take a quick look inside your brine tank to see if there is any salt that has gathered. If so, you may need to have your water softener serviced by a professional as soon as possible. If you notice a change in your home’s water pressure, you may have a faulty water softener. Recognizing these signs is the first step to ensuring that your home’s water softening system is functioning properly. Knowing the risk factors that affect water softeners can help keep your plumbing system working at an optimal level. Water consumption levels are a common factor affecting water softeners, so changes in household size can lead to issues related to their performance. Also, the quality of your water softener must be considered. Although there are plenty of inexpensive options on the market, these devices can end up wearing out faster than expected. This leads to additional costs when servicing or replacing them in the future. Higher-end water softeners may cost more upfront, but they can last longer, and typically they come with a warranty to protect your purchase. 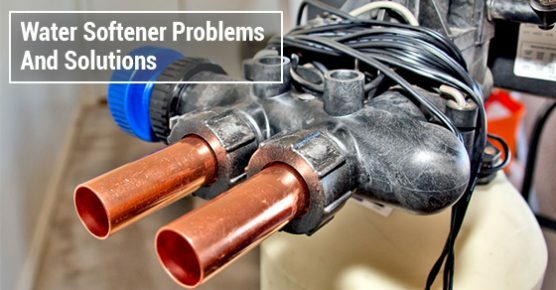 Water blockages that result from the buildup of salt and minerals can impact the integrity of your water softener. When these materials build up, they restrict flow through the tank. Checking your filter screens and brine line can help you prevent these issues. When Do You Call a Professional? Water softeners that are no longer functioning should be addressed through the use of a professional plumbing service. They’ll be able to determine whether or not it needs to be replaced, while identifying the factors that may be contributing to its failure. If you find yourself having to replace the device more often than you should, it may be a sign that other aspects of your home’s plumbing need to be addressed. Understanding how a softener’s media grade, resins, control valve, and other parts work to soften the water helps you determine why your water softener isn’t working properly. Getting the most out of your home’s water softener can improve the quality of water that you and your family consume each day. Knowing what to look for when your water softener isn’t working can prevent future plumbing issues and reduce the costs of maintaining your plumbing system.